Stretchtape’s extended core stretch film is ready to use directly out of the box and doesn’t require separate dispensers, handles, or a machine. This easy-to-use stretch film is manufactured with an elongated or extended cardboard core which acts as a ready-to-use handle for each roll. Our extended core films come with either one- or two-sided sturdy core extensions, making them ideal for portable packaging needs. 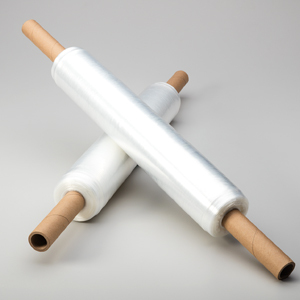 Extended core stretch film is most useful for businesses that need stretch film, but do not have high shipment loads (for those with high shipment loads, check out our Machine-Grade Film). Extended core stretch film users can incorporate two-handed manual stretch film dispensers to increase the ease of use and more tightly secure loads. 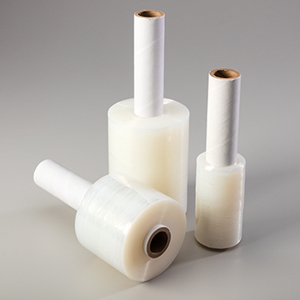 Extended core stretch film is ideal for tight or crowded workspaces where machines cannot easily fit or reach. When packagers need to bind at the same time, the extended core means packagers do not have to wait for an available dispensing accessory, as each roll has a built-in handle. Our extended core stretch film is durable, resistant to tears, and can be easily applied and removed. It is great for keeping pallet items tightly wrapped and unitized items stable as the film retains its tension while in transit. 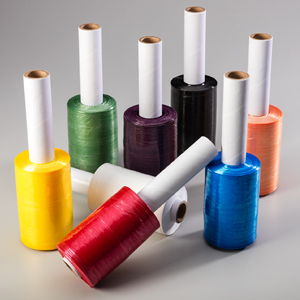 Stretchtape’s extended core film comes in a variety of colors as well as high performance equivalent and pre-stretched films. Custom sizes and gauges, and core specifications are available upon request.